If you have any bare aluminum, be sure to prime it with acid etching primer (for aluminum). You can purchase self-etching primer at NAPA auto stores. Note from Paul Hecht as some Lowes are telling folks they cannot mix up oil-based enamel anymore: Valspar Signature, use the same code as shown just above. For exterior ask for Valspar Ultra, paint and primer in one with ultimate weather defense; comes in brown can. From Dan: During my rebuild I found a piece of aluminum with the aqua blue in pristine condition in a cranny. I took it into Ace Hardware for color matching and had a quart made up. After the paint dried it matched the original, at least on mine, perfectly. Below is the paint formula you requested for the Sierra-100 Turquoise. Ron reports that Krylon Blue Ocean Breeze is a close (slightly lighter) match to the original Scotty aqua. 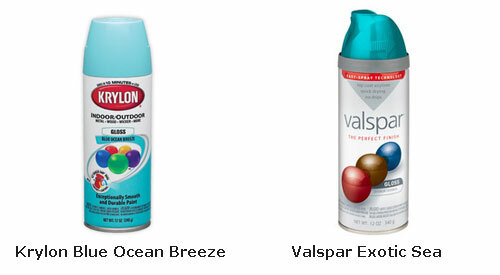 Tammy reports that Valspar Exotic Sea is also a close (slightly darker) match.